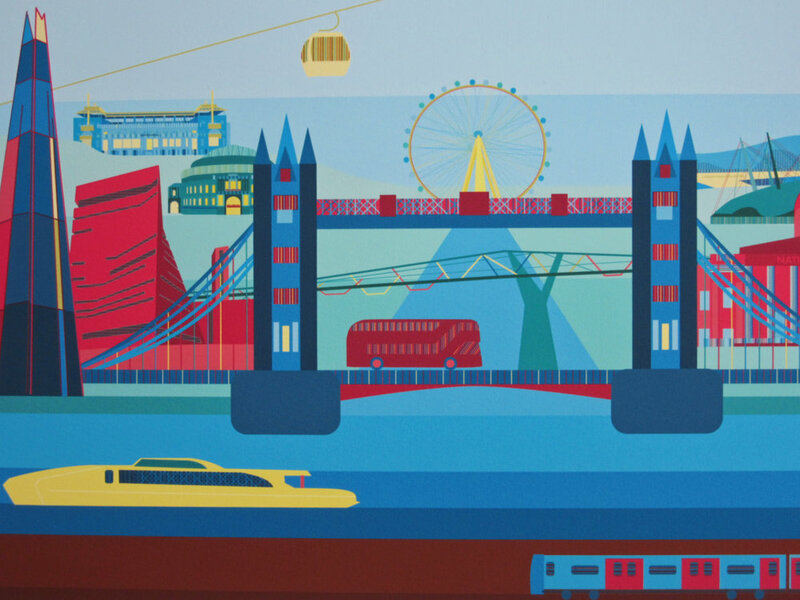 My latest London cityscape art print compares and contrasts historic and contemporary icons of the skyline. One of the things I love about London architecture is the eclectic mix of styles that have developed, telling the history of the city. I picked different areas of life in the city to explore - sports (Lord’s Pavilion to the London Aquatic Centre), transport (the Clipper and cable car to the tube and black cab), entertainment (Royal Albert Hall to the 02 Greenwich), art (National Gallery to Switch House Tate Modern) along with tourist favourites. The time period ranges from the completion of St Paul’s in 1708 to Switch House in 2016. Rich, warm and vibrant were the feelings I wanted the print to evoke. Warm reddish-pinks and yellows are offset by bright blues and deep turquoise, bringing the city to life. Architectural features of each building are highlighted with minute stripes, and some include the building name (visible on large sizes). This is a print full of hidden intricacies, ideal as a large print for a feature wall and just as suitable for a child’s bedroom or your living room.